JACOB CONTINUED ONhis way, getting ever farther away from his brother Esau‘s wrath. At last he reached Haran, the place where his uncle Laban dwelt. He saw a green field, and in the field a well. Three flocks of sheep were lying there, resting, and waiting to be watered. As Jacob drew near he greeted the shepherds and asked them whether they knew a man named Laban. Jacob toiled for seven years in his uncle’s service, and the time seemed to pass very quickly, for he knew that at the end of that time he would win the hand of A great wedding feast was prepared, and the wedding day came at last. 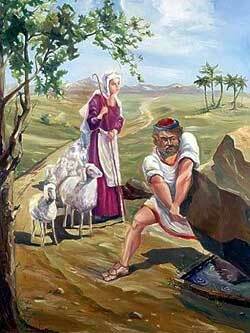 Jacob was full of happiness, but, alas Laban deceived Jacob, and forced him to marry Leah, the older daughter instead. Jacob was very angry at this, but Laban explained that a younger daughter cannot marry first, but would have to wait until the older daughter was married, so that Jacob would have to work for him seven more years if he also wanted to wed Rachel. This entry was posted in Discipleship and tagged Jacob, Laban, theology. Bookmark the permalink.